Chemical Peels can offer significant improvement in the tone and texture of your skin. They slough off the dead layer of skin on the surface, revealing new skin underneath. At the same time they even out tone. At Imagen, we use The Perfect Peel, which is safe for all skin types and contains anti-aging ingredients in addition to the peel. It can improve sun damage and age spots, reduce appearance of fine lines and wrinkles, improve acne and its scars and firm skin by stimulating collagen production. The Perfect Peel is a medical grade, combination chemical peel that contains Glutathione. The Glutathione is a powerful antioxidant, which penetrates deep into the cellular layer of the skin to fight oxidant damage and provide improvement in premature wrinkling. It also reverses melanin metabolism, to lighten dark pigments. Kojic Acid – a potent lightening agent which reduces or eliminates hyper pigmentation also increases collagen and elastin production, leading to brighter, tighter skin. Salicylic Acid – an exfoliant that improves inflammation, reducing acne and melasma while smoothing the skin’s texture. TCA, Retinoic Acid and Phenol – Anti-aging ingredients that reduce wrinkles * and correct pigment problems while increasing collagen and elastin in the skin to tighten skin and reduce pore size. The Perfect Peel also contains a blend of minerals and vitamins, including vitamin C.
The Perfect Peel is applied on day 1 and is left on overnight. This allows the components to soak into the skin to begin the process of removing skin imperfections. You will use a retinol wipe to clean your face for the first 2 days after the peel (this is included in the peel package). Peeling generally begins on the 3rd day. The skin will appear dry and flaky during this time. You will be provided with a vitamin C moisturizer to assist with the peeling process and enhance your results. 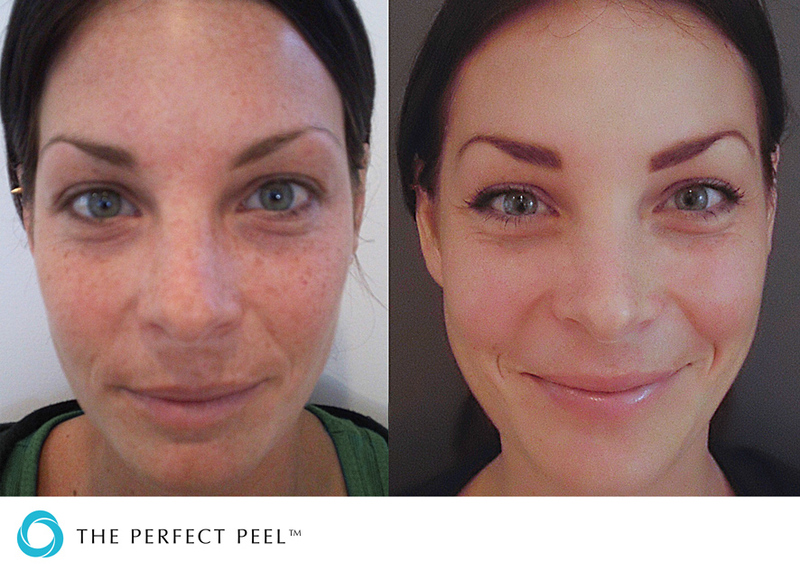 Peeling is generally complete by day 6 or 7, revealing fresh, new skin underneath. It is generally recommended to repeat the Perfect Peel every 4-6 months to maintain your skin health *.